Coteccons is a leading player in the construction industry operating on site throughout Vietnam. Coteccons considers a tolerable risk only is acceptable in all its workplaces taking into account the complex nature and high safety and environment risk factors of the construction industry together with its constant changes of work conditions. Geographical, cultural and social conditions pertaining in Vietnam are also considered in the implementation of processes for occupation health safety and environment. It is the policy of Coteccons that works be carried out in a safe and efficient manner at all its workplaces. 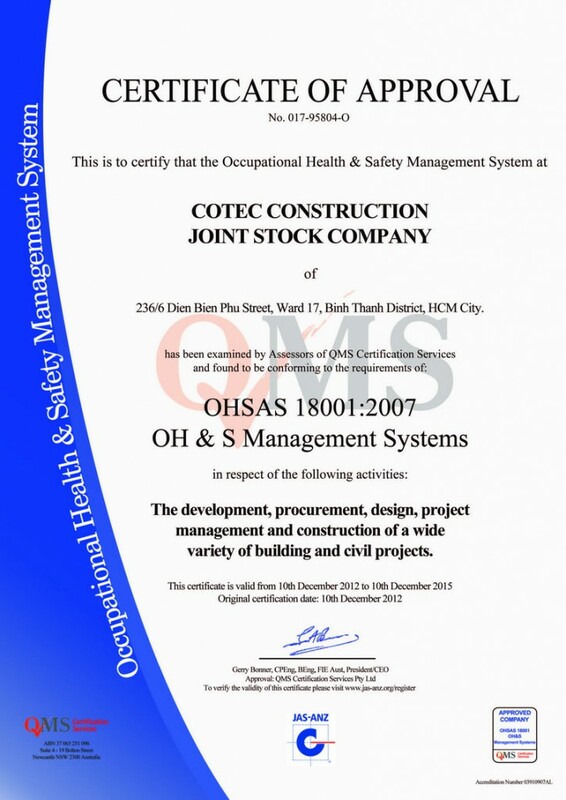 Occupation health safety and environment awareness is regarded as a prerequisite in all Coteccons operations. No Employee of Coteccons is required to work in an unsafe polluted workplace. Coteccons policy is to involve all its workforce in the implementation, measuring and continual improvement of safe and environment work practice. Responsibility and involvement at all levels means employment ownership of safety and environment and the desire for its effective implementation. Safety and environment are the responsibility of all persons. However the standard will be set by all Coteccons management staff for a safe environment in which to work. Safety and environment issues put into practice by Coteccons are practical, effective and enforced. Human resources within Coteccons organization is recognized as our most valuable asset. We regard safety and environment as our 1st priorities and consider that it is the responsibility of Coteccons to ensure workplace conditions neither jeopardize the health and safety of any of our employees nor harm the environment. Safety and environment management is documented implemented and maintained as set out in the Coteccons Procedures Manual. Implementation at Coteccons workplaces is, in the main, carried out using a set of standard forms, work method statements, audit process and training. A copy of the Occupation Health Safety and Environment Policy is posted on Coteccons website and notice boards at all Coteccons workplaces. Review Safety and environment procedures are under constant review and are updated and improved as “OUR EXPERIENCE DRIVES US FORWARD”.